“Milestones in the History of U.S. Foreign Relations” has been retired and is no longer maintained. For more information, please see the full notice. In the early 1960s, U.S. President John F. Kennedy and Soviet Premier Nikita Khrushchev each expressed deep concern about the strength of their respective nations’ nuclear arms forces. This concern led them to complete the first arms control agreement of the Cold War, the Limited Test Ban Treaty of 1963. This treaty did not have much practical effect on the development and proliferation of nuclear weapons, but it established an important precedent for future arms control. Both superpowers entered the 1960s determined to build or maintain nuclear superiority. The Soviet Union had led the way in the development of intercontinental ballistic missiles after its launch of the first man-made satellite, Sputnik , in 1957. In just a few years, it had developed an arsenal of long and medium range missiles that had raised alarm in Washington. President Kennedy had even campaigned for office on a claim that President Dwight Eisenhower had allowed the Soviet Union to far out-produce the United States in nuclear technology, creating a “missile gap.” However, soon after he took office, the Kennedy Administration determined that the balance of nuclear power remained in favor of the United States. With both sides working to develop new and better nuclear technology over the course of the late 1950s and early 1960s, each engaged in a series of test explosions. These nuclear tests received worldwide scrutiny, not only for what they meant for the arms race but also for what they meant for human life. As the United States, Soviet Union and United Kingdom tested new nuclear technologies in the earth’s atmosphere, concerns emerged worldwide about the potential effects of radioactive fallout on the people exposed to it. This led to the formation of activist groups and public discussion of the issue. The three countries entered into negotiations for a comprehensive test ban treaty in 1958. Having recently completed rounds of tests, at that time all three entered into a voluntary moratorium on all forms of testing, initiated first by the Soviet Union but later adhered to by the United States and Great Britain. In spite of this willingness to self-restrict testing, one of the most difficult issues preventing the conclusion of a formal treaty was the question of verification. The United States and Great Britain, in particular, pushed for on-site inspections of Soviet facilities as without them, it was impossible to determine whether the Soviets were continuing underground nuclear tests or just experiencing the frequent seismic activity to which its geographic area was prone. However, the Soviets were hesitant to permit such onsite inspections of its nuclear facilities, interpreting U.S. insistence on these inspections as a ruse to facilitate U.S. efforts to spy on Soviet advancements. After the Soviet military shot down an American U-2 spy plane over Russia in 1960, the prospects for reaching an agreement on the inspections issue all but disappeared. Khrushchev also rejected the idea of having the United Nations conduct inspections after observing what he believed was the organization’s mishandling of the Congo crisis. Instead, in the wake of these incidents both the United States and the Soviet Union resumed testing. 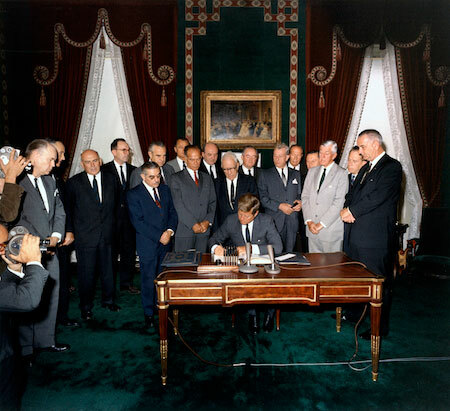 In 1961, Kennedy established an Arms Control and Disarmament Agency within the U.S. Department of State, and the new organization reopened talks with the Soviet Union. That year, however, neither side was ready to make major concessions. As long as it remained difficult to verify that the other side was not engaging in clandestine testing, there was little incentive to form an agreement. Over the course of the next year, however, the situation changed dramatically for a number of reasons. Concerns about nuclear proliferation increased interest in the testing ban, as France exploded its first weapon in 1960 and the People’s Republic of China appeared close to successfully building its own atom bomb. However, it was the rapid escalation of the Cuban Missile Crisis in October of 1962 that compelled leaders in both the United States and the Soviet Union to pursue more aggressively an agreement that could help them avoid the devastating destruction that nuclear warfare would bring. Although the crisis provided the impetus for an agreement, its final negotiation was made possible by the decision to step back from the original idea of a comprehensive test ban treaty and work instead on a more limited arrangement. Atmospheric and underground tests proved equally effective for scientific purposes, so there was no reason to insist that access to both types of testing remain available. In past negotiations, the inability to detect underground explosions and agree on provisions for inspections to ensure such explosions were not taking place became a problem that prevented an agreement. Once the Soviet Union and the United States decided that underground testing would not be included in this first treaty, the two sides very quickly reached terms they could agree upon. The Limited Test Ban Treaty was signed by the United States, the Soviet Union, and Great Britain in 1963, and it banned all nuclear tests in the atmosphere, in space, or underwater. Because it stopped the spread of radioactive nuclear material through atmospheric testing and set the precedent for a new wave of arms control agreements, the Treaty was hailed as a success. The Treaty was the first of several Cold War agreements on nuclear arms, including the Non-Proliferation Treaty that was signed in 1968 and the SALT I agreements of 1972. In 1974, the Threshold Test Ban Treaty returned to the question of nuclear testing by limiting underground testing of bombs with a yield greater than 150 kilotons.